At Nambiti Hills, we regularly see many special sightings with our Guests. Whether it’s Houdini, making a kill in the early hours of the evening, the birth of a flock of baby ostrich or two bull elephants playfully pushing each other down a hill. There are so many exciting events on a daily basis that it’s hard to pick out the best. Sometimes, our Guides get excited about certain sightings, and with their range of Game Viewing, they really are the experts. 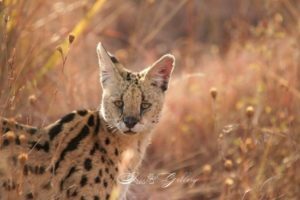 Recently at Nambiti Hills, we have seen a particularly illusive cat in our midst. The Serval Cat. This creature usually slips by in the night, going unseen for months at a time due to its size and diurnal habits. 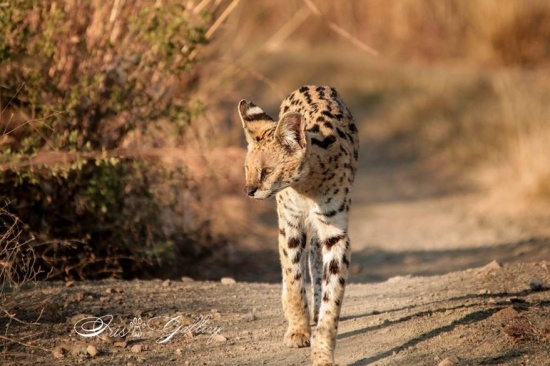 Usually, the place to see this cat is on the grassland hunting for birds – but even if you go out in search of a Serval, you’re unlikely to find it. When you do spot one in the wild, they are wonderful to watch. They have a curious and shy nature with many quirks to their personality. They can jump incredibly high, up to 2 metres, making them the highest jumpers of all the cats in the kingdom. Preying on smaller birds, their hunting habits are humorous too, because they use their paws to “slap” down birds, stunning them before making them into a meal. If you’ve been lucky enough to see some of our beautiful serval cats on a Game Drive, send your pictures or stories to marketing@nambitihills.com so we can share it with the Nambiti Hills Family.